Everybody has a doppelganger, even your Shiba Inu. And that doppelganger might not even be another Shiba Inu but a Korean Jindo. For those with an untrained eye, placing these two breeds side by side will result in a lot of confusion, because both breeds carry many of the same characteristics. Yet, despite the physical similarities of the Japanese Shiba Inu and Korean Jindo, the personalities of these two breeds is no where near identical. Knowing where the breeds come from is the most important part in distinguishing the differences in the Jindo and Shiba Inu. Because they are both Spitz-type dogs with double coats, it's the faint adaptations of each breed that truly make them unique. The Jindo is a breed of hunting dog and is thought to hail from Jindo Island in Korea, despite there being no written record. One theory of where Jindo dogs actually come from is that they are a cross breed with Mongolian dogs from when the Mongol forces invaded Korea in the 13th century. In 1962, the Government of South Korea named the Jindo a natural treasure and made it incredibly hard to export purebred Jindo from beyond Korea. To this day, there are very few Jindo registered in the United States and other parts of the world. Common nicknames for the Jindo breed include Korean Jindo Dog, Chindo, Jindo Gae, and Jin Dog. Like Jindo, the Shiba Inu was bred for hunting in the mountainous terrain of Japan. 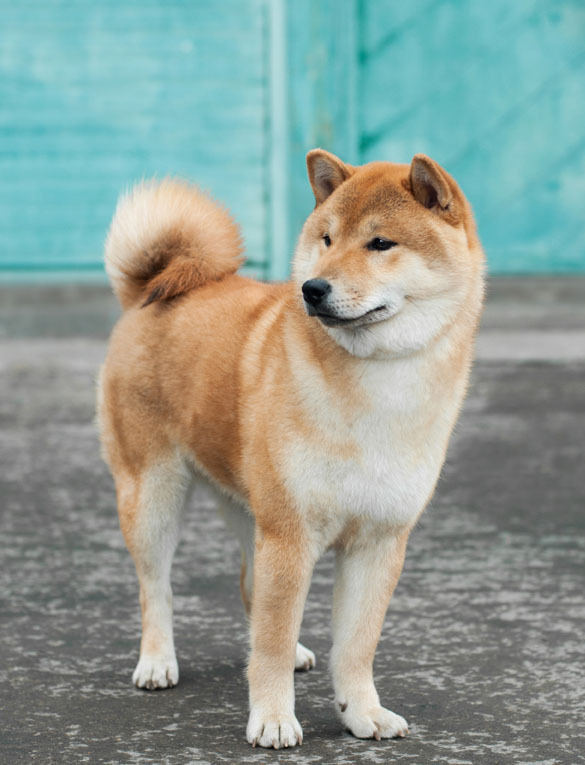 However, unlike Jindo, the Shiba Inu has a distinct, pure bloodline that can be traced to the beginning and is different from other Japanese breeds like the Akita and Hokkaido breeds. During WWII, the breed was almost wiped out but was brought back from the brink of extinction by three bloodlines. 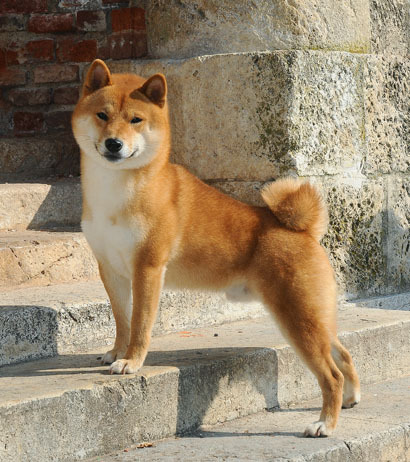 Unlike the Jindo, the Shiba Inu is popular in Japan and the rest of the world. In 2016, the Shiba Inu was the 44th most popular dog breed in the US. The Korean Jindo Dog is said to be unwavering in loyalty and has a gentle nature around those they serve. Because of their high energy, Jindo pair up best with physical active masters and enjoy jobs of a similar description, such as military or police duty. For example, if a Jindo is kept alone in a yard, that yard should have at least 6 foot tall fencing. Otherwise, the Jindo will bound right over the fence to go wherever their master is. Active and intelligent, the Jindo is a masterful escape artist with a mind of its own. In fact, they are often so intelligent as to be near impossible to fully train—especially when matched with an unseasoned dog owner. Therefore, Jindo need a role and plenty of stimulation to remain well behaved. Jindo also show extreme dislike of getting wet. They don’t like getting rained on, and they will be reluctant to take baths. Yet, when they know they have a family to protect, they will happily sit outside, serving as gatekeepers to ensure their owners are safe. You might have heard that Shiba Inu are cats instead of dogs, and that might be true. So fiercely independent is the Shiba Inu that it will sometimes show aggression when it is unable to act as it wants. This is especially true with female Shiba Inus. 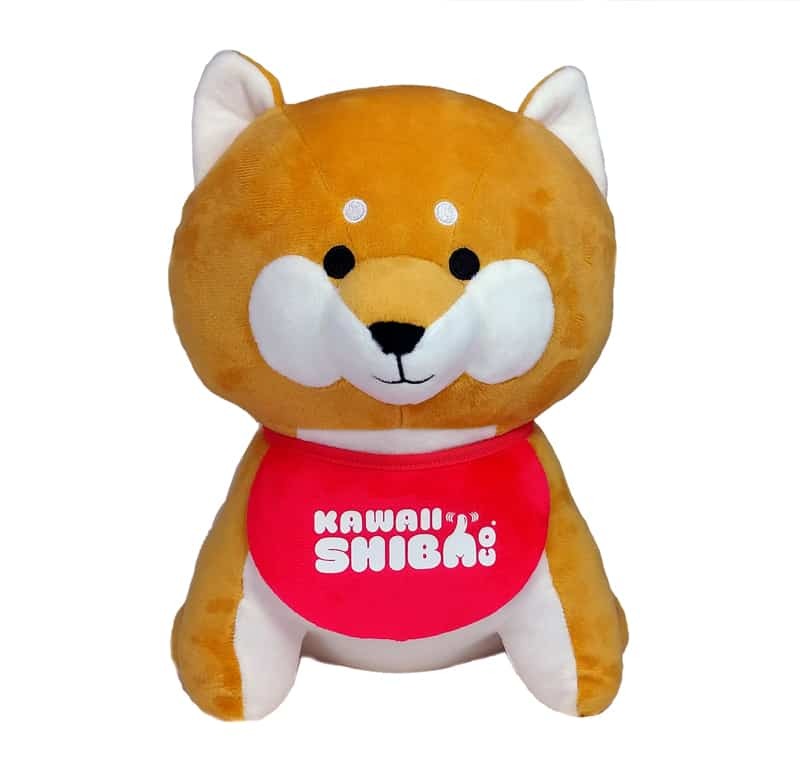 Because of this, Shiba Inu are often best when they are the only dog in the family, but with consistent socialization and obedience training, a Shiba Inu can quickly adapt to any situation, from sharing space with children, other dogs, and even cats. The Shiba Inu is not as active as the Jindo, but the breed does require daily exercise. They are also incredibly fastidious. Like felines, Shiba Inu will clean their bodies and paws to ensure they are pristine. Since Shiba Inu love cleanliness, they will often housebreak themselves. 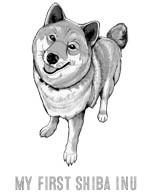 Another characteristic of the Shiba Inu that differs from the Jindo is how vocal this breed can be. The Jindo is relatively silent unless provoked. Whenever a Shibe feels even the faintest need to show distaste or excitement in something, they will scream—shrilly. At the core of both breeds, you have a highly intelligent, loyal dog that can get into trouble if you don’t provide them with enough mental stimulation. Appearance and health are also ways to discern differences in the two breeds. Despite some shared Spitz characteristics, like fox-like features, coloring, and pricked ears, the Jindo and Shiba Inu are not completely identical. Since the Jindo has features that can easily be confused for a Shiba Inu, distinguishing it from other breeds often comes down to close examination of cranial and facial features, as well as analyzing the head in proportion to the body. The breed does have sexual dimorphism. Females are much more sleek and angular than their male counterparts. The breed also has a double coat and forward-pointing upright ears. 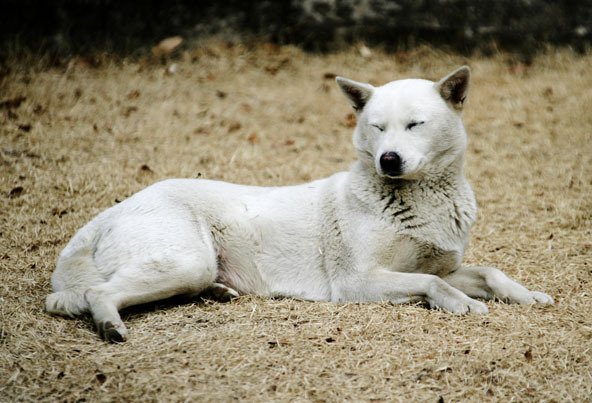 The are two body types of the Jindo breed—the Tonggol/Gyupgae and the Hudu/Heutgae. The Tonggol/Gyupgae body is muscular, stocky, and has equal proportion of height and the withers to total length (10:10). The chest is equal to one-half the height at the withers. On the other hand is the Hudu/Heutgae type, which is slender, has less depth in the chest, and has elongated facial features. Both have almond shaped eyes and slightly rectangular muzzles. Brindle – also called “tiger.” Features black or brown stripes over a fawn-like base. Jindo height usually is around 19.5 to 21 inches (48-53 centimeters). Males run around 40-60 pounds (18-27 kg), while females are 35-55 pounds (16-25 kg). The mochi-mochi cheeks of a Shiba Inu, compared to the sleeker, more streamlined head of the Jindo, is a dead give away. Unfortunately, you can't squish the cheeks of a Jindo like you can a Shiba. A Shiba Inu also have shorter ears than their Korean counterpart, and their muzzles are much narrower and fox-like. The nose is always black, and the teeth meet in a scissor bite. Shiba Inu have curled tails and a corded, double coat that sheds far more often than a Jindo’s coat. The skeleton of the Shiba Inu is also much more compact than a Jindo Dog. The chest and legs are muscular, and the male’s chest is often broader than the hips. Red -- a fox fur color that patterns the back of the head, shoulders, and back with urajiro markings (white or cream) on the cheeks, vent area, and belly. Cream - an off-white color that cannot be shown in official dog breed shows. The important characteristic is the “urajiro (underside white)” of the coat cannot be seen in Cream Shiba Inus. 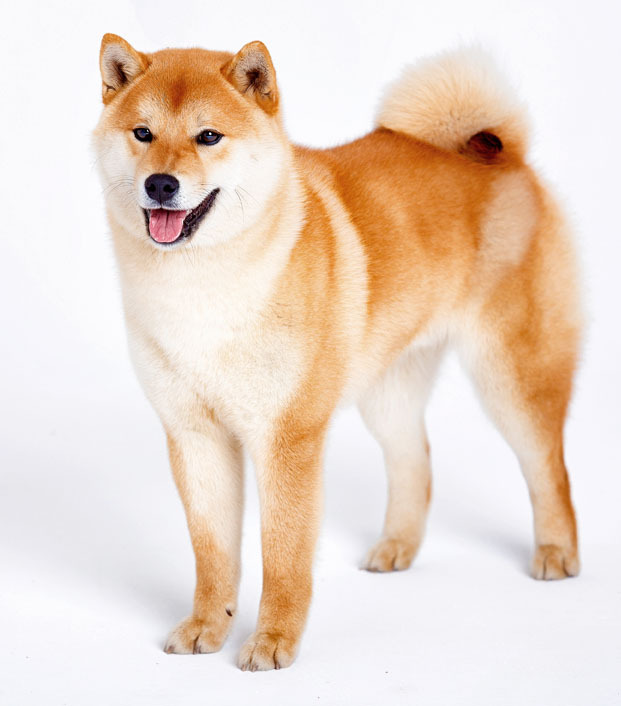 Sometimes, if a Shiba Inu is cream or white, it is considered unfavorable with breeders because you can’t see the urajiro. Don’t let that keep you from loving your white or cream Shiba Inu though! The height of Shiba Inu is smaller than that of their Korean brethren. Male Shibas stand at 14-17 inches (35-43 cm) and weigh around 22 pounds (10 kg). Females usually are 13-16 inches (33-41 cm) tall and weigh 18 pounds (8 kg). In short, the Korean Jindo is much taller, sleeker, and narrower, regardless of their type or gender, probably due to evolving to hunt larger game. Meanwhile, the Shiba Inu, which was bred to hunt for rabbits and other small mammals hiding in the undergrowth is compact, muscular, and has a tapered skull. So basically both breeds look foxy, but the main differences can be seen in their height and weight. Now that you have seen the comparison of these two breeds, you should now be able to tell a Jindo and Shiba Inu apart. If you are still having some trouble just remember the key points. 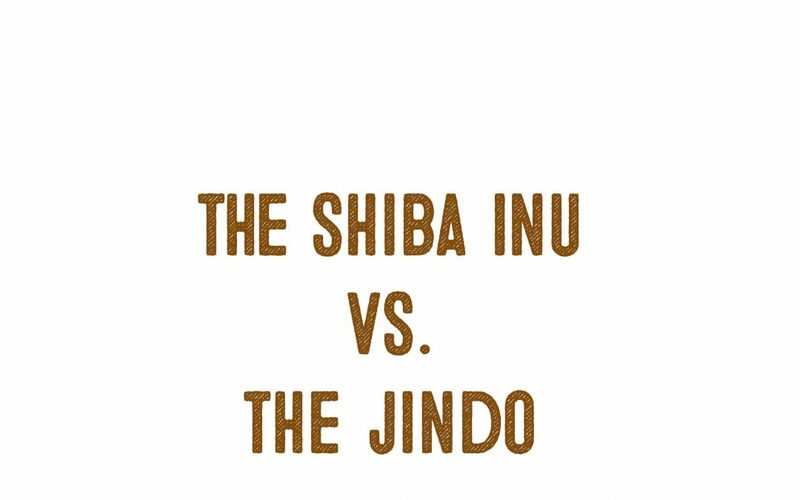 Shiba Inu and Jindo both require moderate maintenance, but the Shiba Inu is slightly more mouthy and cat-like than the Jindo, which behaves much more like a dog. Shiba Inu are also much more adaptable and are better suited for apartment life and new owners. However, the loyalty and love of any dog knows no comparison.